Many of the fabulous treasures from the Tomb of King Tut are coming to the UK. The King Tut exhibition is currently on tour at the Franklin Institute Science Museum in Philadelphia until September 2007. The Tutankhamun London Exhibition is planned to start on 15 November 2007 at the O2 (once called the Millennium Dome) in Greenwich in South London. Tickets go on sale during September 2007. The name of the Tutankhamun London Exhibition is 'Tutankhamun and the Golden Age of the Pharaohs'. The Tutankhamun London Exhibition will be displayed until to 30 August 2008. The Tutankhamun London Exhibition is planned to start on 15 November 2007 at the O2 (once called the Millennium Dome) in Greenwich in South London. The new 02 arena can be accessed from the North Greenwich tube stop on the Jubilee Line. 'The O2 Bubble' or 'O2 Arena' takes its name from the O2 communications company and has been regenerated as a massive indoor sports and performance arena. The O2 provides exhibition space which is connected to a high-tech amusement complex, cinema theatre and hotel. 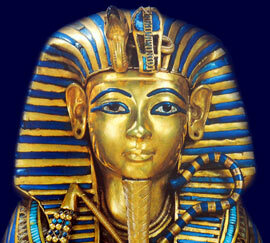 The Tutankhamun London Exhibition tour is the first exhibition to be displayed at the O2. Visitors to the London Tutankhamun Exhibition can expect to spend approximately 60 - 90 minutes at the O2 which will provide ample time to take in a visit to the Maritime Museum and Greenwich clock, local antique markets and even take a trip on the River Thames in a pleasure boat. Alternatively keep the Ancient Egyptian theme and visit Cleopatra’s Needle on the banks of the River Thames, the Ancient Egyptian displays at the Horniman Museum in Forest Hill, South London and the world famous Rosetta Stone at the British Museum together with its other Ancient Egyptian Displays. The re-vamped O2 venue is expected to host this attraction for millions of visitors to London. The last Tutankhamun London Exhibition visited London in 1972 when it attracted 1.7 million people. The objects on display are not the the same as the 1972 exhibition. Nearly all of the 130 objects in the 'Tutankhamun and the Golden Age of the Pharaohs' exhibition have never been seen before in the UK. In fact, only seven of the Ancient Egyptian Artefacts in the 2007 Tutankhamun London Exhibition are repeat items from the 1972 event. The Tutankhamun London Exhibition at the Greenwich O2 will display over 130 Ancient Egyptian Artefacts, which is nearly twice the size of the original King Tut exhibit. These Ancient Egyptian artefacts include 50 objects which were taken directly from the tomb of King Tut together with 70 objects from the tombs of his ancestors in the Valley of the Kings including the pharaohs Amenhotep II and Thutmose lV. The collection is presented in eleven different galleries and includes a fabulous pectoral, his gold crown and one of the gold inlaid canopic coffinettes which contained the mummified internal organs of Pharaoh Tutankhamun. This gold miniature coffin is about 16 inches long and was used to store the liver of King Tut which was removed during the mummification process over 3000 years ago. The Ancient Egyptian artefacts were selected for display by Dr. Zahi Hawass and Egypt's Supreme Council of Antiquities. Comprehensive facts and information on all of the above subjects can be accessed by our sitemap. Fast facts and info may also be found via links on this King Tut Treasures and Exhibits Index which we hope will 'wet your appetite' for Ancient Egyptian History and the Tutankhamun London Exhibition. Each section of the Tutankhamun London Exhibition addresses all topics and provides interesting facts and information about the Golden Age of Pharaohs and of Egypt. The Sitemap provides full details of all of the information and facts provided about the fascinating subject of the Pharaoh - Tutankhamun and the Tutankhamun London Exhibition!